The legend of the Jersey Devil comes to us from the State of New Jersey, USA and neighboring states. The Jersey Devil’s history places it at the very top of baffling crypto- zoological mysteries. It is a very elusive cryptid that has baffled and mesmerized the public for hundreds of years. The biggest conundrum to dismissing the beast as pure myth is that numerous reputable people, both past and present, have claimed to have seen it. The Jersey Devil has a strange general description, having the combination of body parts and looks of a variety of currently known animals. The creature is often described as a flying bipedal cryptid with hooves, but there are many contrary opinions as to what it actually looked like. The common description from eyewitnesses is that it kind of looks like a kangaroo-like creature, but with the head of a horse, leathery bat-like wings, and long bird-like legs, claws, hooves, a hideous face, and a forked tail. Several people have even said its body looks like an alligator. It allegedly inhabited the Pine Barrens of Southern New Jersey and was named the official state demon in 1939 in New Jersey. View north from a fire tower on Apple Pie Hill in Wharton State Forest, the highest point in the New Jersey Pine Barrens. ( CC BY 3.0 ) The Jersey devil allegedly inhabited this region. It has been reported to move quickly, and has often been described as emitting a "blood-curdling scream.” Eyewitnesses say that it hops like a bird. It has been called a variety of different nicknames such as the flying death, kangaroo horse, flying horse, cowbird, and a prehistoric lizard. Walter Edge, twice governor of New Jersey, was quoted saying: "When I was a boy--I was never threatened with the bogey man--we were threatened with the Jersey Devil, morning, noon, and night." It wasn’t a phony creature to Edge or his companions - they had no doubts that it was real. However today the majority of people are skeptical and don’t think it’s real. There was an old folk legend that she was a witch, however, healers or herbalists were often labeled that as well at that time. There is also a strange tale of an exorcism being performed in the year 1740 by a Quaker minister to expel the Jersey Devil, supposedly banishing the beast from their midst for the next 100 years. Quakers had a ritualistic habit of quoting the bible verse by verse, and they often bought charms to ward off evil spirits. Being highly superstitious, Quakers had a remedy to ward off the Devil, which used a folklore method of throwing salt and pepper around the house. In the beginning, it was known as the Leeds Devil, but the Jersey Devil name became more popular. 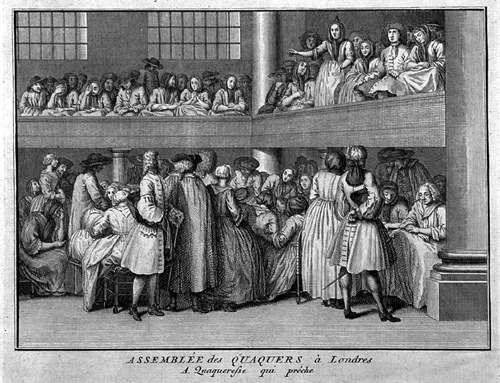 Quaker women had a penchant for spinning tall tales when they met. Story telling was a favorite pastime; it was gossipy entertainment, telling thrilling horror stories to titillate their friends. They didn’t have horror movies, but they did have gossipy scary stories to tell over a candle at night to scare children and women folk. This was their style of entertainment: juicy gossip. One such story claims that during 1735, Mother Leeds was in labor on a stormy night while her friends gathered around her. Born as a normal child, the thirteenth child is said to have changed to a creature with hooves, a goat's head, bat wings, and a forked tail. Growling and screaming, it allegedly killed the midwife before flying up the chimney and heading into the pines. From January 16 to 23, 1909, the State of New Jersey experienced a major paranormal event, it was seen in person by thousands of people, schools were closed, and factories closed down temporarily out of fear. Bizarre reports say that people saw a human form, but the eyewitnesses refused to say anything more about what they had encountered. This suggests that the Jersey Devil possesses unusual abilities of shape-shifting to disguise its true form. The following are three unusual cases that took place in the lives of regular people. They’re dramatic narrative stories of real people who said they saw the Jersey Devil in the flesh. #1: Police Patrolman James Sackville: In Bristol, Pennsylvania one sighting was made by Patrolman James Sackville. Patrolman Sackville was walking his beat Sunday evening. As he was walking toward Buckley/Carson Streets, he heard some dogs barking and howling. As he got closer, he turned and saw a Jersey Devil standing by the canal. He pulled his pistol out and ran up toward the Jersey Devil; the creature then turned and started hopping down the canal towpath, then it took flight to get away. He got a couple of rounds off as the creature flew close to the ground, then it soared up into the night sky and disappeared. He described the beast as being winged and hopping like a bird, with features of a “peculiar animal.” Its voice was like a terrible scream. Sackville confirmed that it was very peculiar looking. 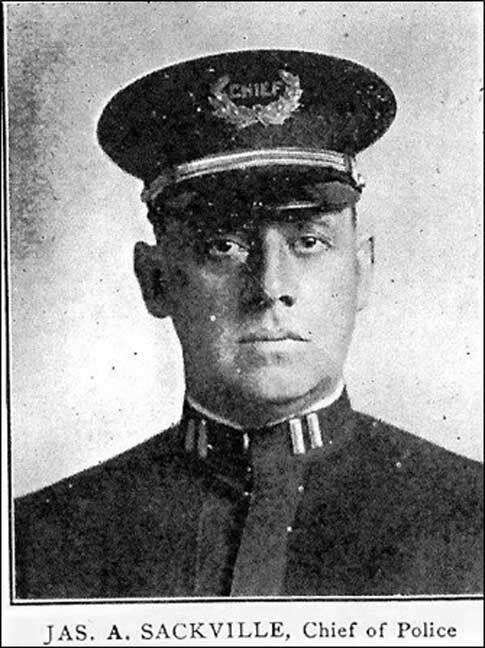 #2: Mr. Frank Rouh: The next incident took place on Ferry Ave, Camden, New Jersey, January 21, 1909 (Thursday) Time: 1:00 AM in the morning. Rouh was the owner of a saloon. His bar was a local social club called the Black Hawk Social Club, located in the 700 block of Ferry Ave. in Camden. Mr. Rouh suddenly became very bothered and distracted by what he described as an "uncanny sound" coming from outside the back window of the club; he turned around to see a creature looking at him through the window. The story relates that the Jersey Devil was standing outside the building and watching him. Rouh feared for his life. When others around him saw the Jersey Devil, they fled the club "in abject fear." Rouh stood his ground and in a desperate stance of self-defense, seized a large club to protect himself, then the Jersey Devil flew off emitting "blood curdling sounds." #3: Mr. and Mrs. J. H. White, Ellsworth St. Philadelphia, PA.: One of the most unusual accounts of the Jersey Devil comes from a couple named White. Mrs. White reported that she saw one in her backyard around 4 P.M.; she was walking down the stairs into her yard with a load of clothes, and clearly saw a Jersey Devil crouching nearby. It immediately stood up, looked at her, and then spewed flames at her. She screamed, fainted, and fell to the ground. Her husband heard her and ran down the stairs, where he saw his wife on the ground. He saw the Jersey Devil shooting flames out of its mouth too. They estimated its height at six feet (1.83 meters) and said that it looked like an alligator. He chased after the Jersey Devil as it jumped over the back fence of their yard, and then it ran into the back alley leading to Sixteenth St., shooting flames at him while he was in pursuit. The Legend of the Jersey Devil in America is supposed to be a local story. In trying to figure out what the Jersey Devil was, I opted to look into history for some better answers, and I soon found a potential candidate. In the modern period, the European dragon is typically depicted as a large, fire-breathing, scaly, horned, lizard-like creature; the creature also has leathery, bat-like wings, two or four legs, and a long, muscular prehensile tail. The Jersey Devil is fire-breathing too! This was a likeness too similar to ignore. 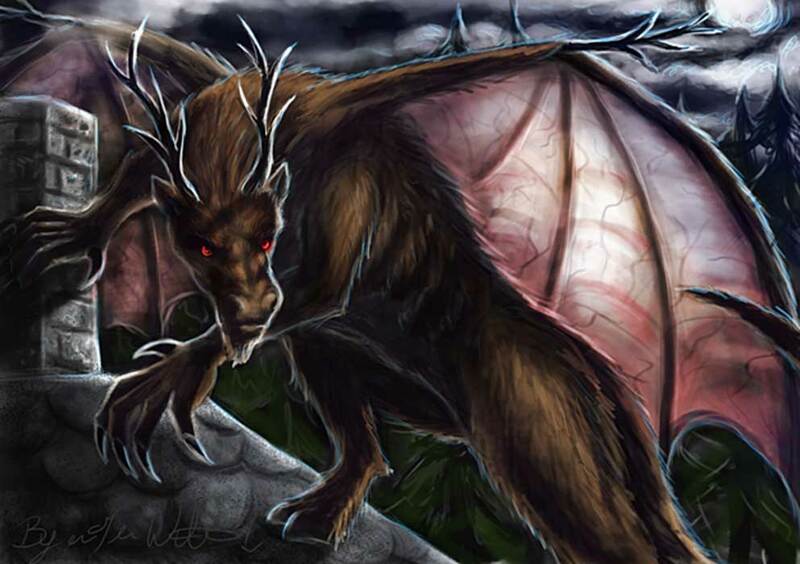 The “Jersey Devil” is just a dragon’s American name. For generations, scientists believed that dinosaurs were cold blooded, like fish, amphibians, and reptiles. Then some scientists began to argue that dinosaurs were warm- blooded, like birds and mammals. As it turned out, they were warm-blooded after all. 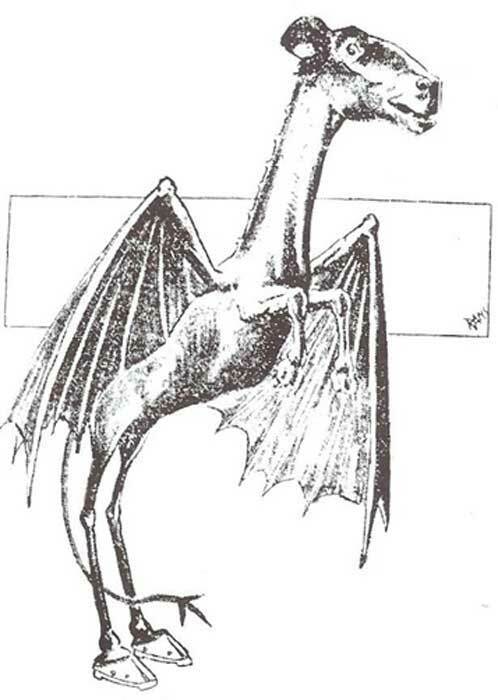 I connected the dots to reach the conclusion that the Jersey Devil was a dragon and a dino-bird. Das Buch der Natur (Book of nature) is a Medieval Latin compendium of science that was edited and translated into German in the 14th century by Konrad von Megenberg. Please look at the creature in the upper right of the following image; to me it looks like a bipedal winged horse with a long tail. This was published 669 years ago. The mythology of horse-faced creatures is widespread, and one of the most prevalent is the legend of the Kelpie. Kelpie (Kelpy), or water Kelpie, is a supernatural water horse in Scotland. I believe that they are one and the same creature, making Kelpie the Jersey Devil’s cousin in the UK. Chogyal Namkhai Norbu, Professor of Tibetan and Mongolian Language and Literature, wrote a ground breaking book titled: The history of Zhang Zhung and Tibet Volume One The Early Period (2013), which provides some startling information of the existence of such creatures, specifically stating that they were Non-Human Beings. A quote from that work states: ‘A fundamental point asserted by some traditional historical sources is that in ancient times that this vast country surrounded by snow Mountains was ruled for a very long time by various nonhuman beings.’ The ancient Tibetan name was Bdud, and in Sanskrit it was called Mara. My theory is that the Jersey Devil is an ancient creature called the Kinnaras and they’re one of the winged flying dino-birds of Earth’s real history. In the Mahabharata, which dates back over 5,500 years, the Kinnaras had their own kingdom in the Himalayas, called the Kinnara Kingdom. Steve Pearse is the author of the book ‘Earth is Our Planet, Too!’, which is available for purchase on Amazon. Jersey Devil was a PlayStation game all along!